Creating graphic memes with quotes is a good way to encourage conversation and shares on social media. Having a standout visual marketing strategy is an important part of building your personal brand’s visibility; and, it’s important that you have a message match. 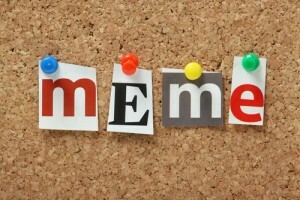 There are many popular online tools today that take the guesswork out of generating memes for your brand. Thousands of high-quality images are available for free download that your audience will love along with free graphic editing tools for computers and mobile devices. 1. Begin with competitor research. Take a look at what other brands in your industry are doing on places like Facebook, Twitter, and Instagram. Pay attention especially to the level of engagement and shares, and this will be a good indication of what is working or not. Decide what you can do in similar fashion, but reflects what is unique to your company. You may notice that many of these memes include a branded logo or text, which is a great way to spread the word. 2. Customize according to social network size. Not all networks are the same when it comes to image size. For example, Facebook currently has its own set of shared image dimensions at 1200 x 1200 pixels, while Instagram is 640 x 640 pixels. Using a platform such as Adobe Photoshop or Canva can help you create the right meme size for each network. 3. Store your memes for later use – Once your personal brand gets a few memes created back them up either on an external drive or on cloud storage. Create a separate folder to save other images in that can used as a reference. Photo albums on Facebook Pages are handy, while hashtags on Twitter can help you find the right category of images that are popular or trendy. 4. Include tags and relevant hashtags – The goal of posting a meme is to create a conversation and visibility. Whenever possible your brand can ‘tag’ users or invite others to share your images. Pay attention to the current popular terms being used by brands, and write a unique phrase or question to illicit a response. A memorable meme can bring more visibility to your personal brand as well as attract new fans and followers. Begin with at least three posts or tweets a week, and stick to a regular schedule to build expectation. Take advantage of the free resources available, including copyright free images from Wikipedia. Quotes with images can be very powerful in spreading your brand message and generate more interactions than regular text.